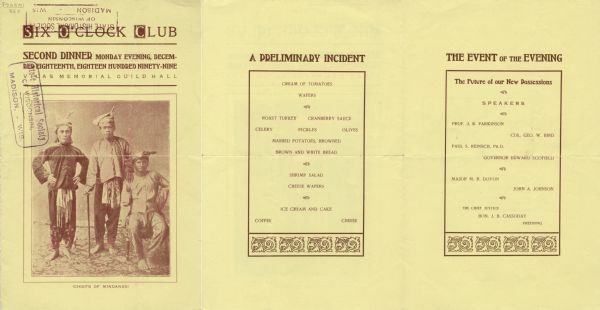 Front cover, menu, and program pages of the second dinner of the Six O'Clock Club, with a studio portrait of three men, one seated and two standing. The man in the middle has one hand on the seated man's shoulder, and the other holds a walking stick. The men are wearing head wraps and traditional clothing. The photo caption reads, "(Chiefs of Mindanao)". The Six O'Clock Club was a men's social and dining club, centered on topics of political and civic interest. The back cover of the menu has a map of the Philippines, Hawaii, Cuba, and Porto Rico, with their population figures. For other Six O'Clock Club Dinner menus, see also Image IDs: 102830, 103636, 103640, 103723, 103782, 103784, 103798, 103802, and 103805.